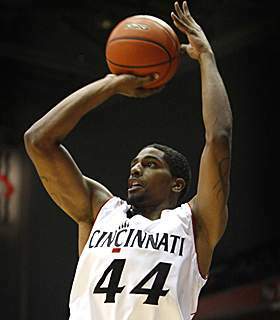 This edition of Bearcats Breakdown is about freshman Jaquon Parker. I don't know if his name is supposed to be spelled Jaquon or JaQuon. I also noticed I spelled his name wrong in the labels because I'm stupid. Anyway, on twitter, he lists his name as JaQuon, so we are rolling with that. Parker didn't come into the season with a ton of hype, but by the end of the year, he earned some for this upcoming season. His hype for the upcoming season is much better than a certain former Bearcats' who we won't mention by name, but feel we should tell you about since it's news. Hopefully things turn out well for him, as we hope they will turn out well for JaQuon Parker. Quickly, we want to take a moment to mention John Wooden. I'm not going to write eloquently about his life, or passing, mainly because I don't write eloquently if you read the comments about me being mean. John Wooden was a great coach, and a better person. He might have cheated at UCLA according to bitter fans, but he was a winner. He was also a quote machine. His website, CoachJohnWooden.com, is amazing. Someone who will use that pyramid of success, is JaQuon Parker. Let's look back at his freshman year. JaQuon Parker played 13 minutes a game in the 26 games he played. He started 8, most at the end of the year when Rashad Bishop was suspended. He averaged 4.2 points a game on 45% field goal shooting. Parker shot a respectable 36% from deep, one of the better percentages on the club. Parker had an offensive rating of 112.5. His effective field goal % was 55.4, and his true shooting percentage was 56. Those are pretty good numbers. What wasn't as good were Parker's free throw numbers. He got to the line at a high rate, but was only 20-33, 60%. That's a number that is going to have to get better with more opportunities, and more practice at the line. Parker's best game scoring wise came out of nowhere really. With Lance Stephenson injured against South Florida, Parker got the start and exploded for 15 points on 6-8 shooting. JaQuon had been getting sporadic playing time before that, and for him to go off was completely unexpected. Parker went on a 6-0 run himself when USF cut the lead to 5 to push the lead back to 11. Parker had a 13 point game in the Big East Tournament win over Rutgers. Parker got that on 4-8 shooting, 3-6 from three. Parker had himself a 5-0 run in that game that pushed the UC lead to 8 with 3:30 left, which was huge because Rutgers made a run to close out the game. Parker also threw a horrible inbound pass in that game to hurt the UC cause, but that's neither here nor there. Parker's third double digit scoring game came against, yup, Texas Southern. He got 10 mostly from the line, going 6-9 from the stripe. Parker scored 9 against CSB, but his other notable game was against Louisville in the Big East Tournament. After the Cardinals got to Parker in the first meeting at Freedom Hall, JaQuon answered big in the BET. Parker had 8 points on 3-9 shooting, but had 9 rebounds. His buckets seemed to all be put backs. He gave UC a 2 point lead with a put back off a missed free throw, and gave UC a 7 point lead when he pretty much stole an offensive rebound away from Kyle Kuric, scored and was fouled. At the other end of the spectrum, Parker had a pretty awful game, as did everyone else, in the Georgetown disaster. He didn't score at WVU, missing a pair of shots. He also struggled as mentioned at Louisville. Not playing a lot helps you not have terrible games that I can mention. JaQuon Parker averaged 2.8 rebounds a game. I know, that's a lot. Parker got 0.8 offensive rebounds, and 2 defensive boards, 17% of the UC defensive boards while he was on the floor, a game. The reason Parker averaged so many boards, was because he was a rebounding machine. He pulled in 9 in the BET game against Louisville, 7 against Texas Southern, 5 at Louisville, 5 against Toledo, 5 against Weber State in the NIT, 5 against CSB, and 5 against Rutgers in the BET. He also had 4 out in Maui against Maryland, and 4 against South Florida. Rebounding is about determination, and few guards on the UC roster were determined to gather rebounds as JaQuon Parker. JaQuon Parker averaged 1 assist per game. His best was 5 in his USF breakout game. He put up 3 against Texas Southern and Louisville, proving without a shadow of a doubt when JaQuon Parker is racking up assists, UC wins. Parker had a career high of 2 steals in the Louisville BET game. His only block came in the win over USF. He got a lot accomplished in a short period of time. JaQuon Parker had a pretty good freshman season once he got some run. The problem was, he didn't get that much run. Like mentioned up top, he only played in 26 games. I think there is room for him to be a player on this year's squad however. With only Sean Kilpatrick coming into the backcourt and Deonta Vaughn and Lance Stephenson and maybe Rashad Bishop out, he's going to have the chance at minutes. I think he has earned a spot. There are minutes to go around for Dion Dixon and Larry Davis, but I think, and the numbers think, they should go to JaQuon Parker.